Walter Benjamin recognized in the first arcades of Paris – built at the turn of the 19th century – the beginnings of iron construction that would culminate in the Crystal Palace building of 1851. Yet, arcades also looked backwards as well as forwards: for Benjamin, they were also still rooted in the luxury culture of the 18th century, private worlds that effectively sealed out the social mixing on the street in an artificial environment – a ‘world in miniature’. The early arcades were commercial speculations, built by a single or joint property owners, with the shops lining the arcade leased to individual traders. They were usually narrow spaces, the architectural potential of the iron and glass roofs subordinated to the dictates of economy. Yet, by the time the Barton arcade was constructed in Manchester in 1871 (1), everything had changed. 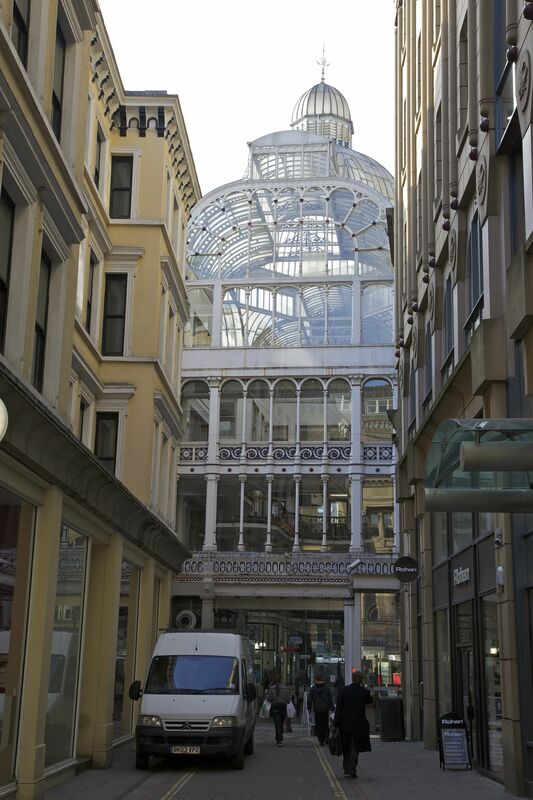 In the second half of the 19th century, the rapidly-growing industrial cities of Britain embraced the arcade as an essential part of civic improvement. 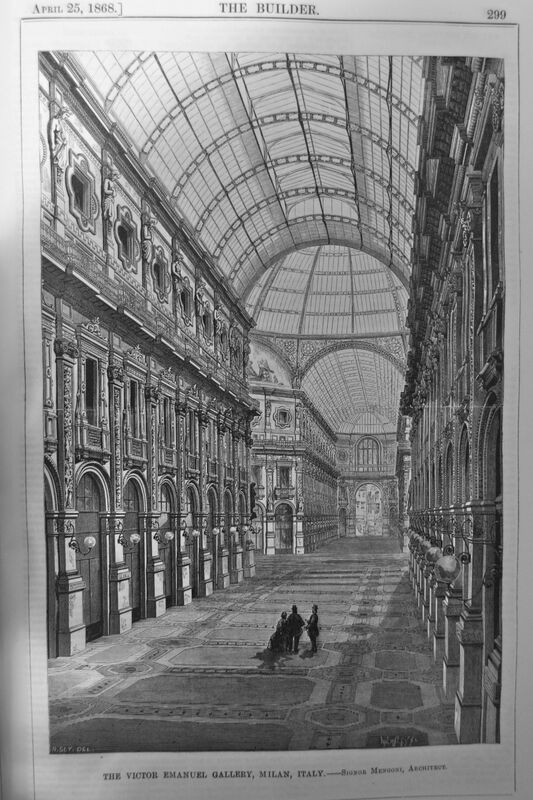 The precedent for this ‘public’ appropriation of the arcade was the Galleria Vittorio Emanuele II, opened in Milan in 1865 and influencing a British audience through the pages of The Builder (2). This monumental arcade was the result of international cooperation; it was financed by a British company, designed by an Italian architect and constructed by a French engineer. Consisting of two wide passages joining beneath an octagonal-based dome 106-ft high, this was an arcade on a colossal scale, richly decorated with frescoes and ornamental cast iron vaulting. 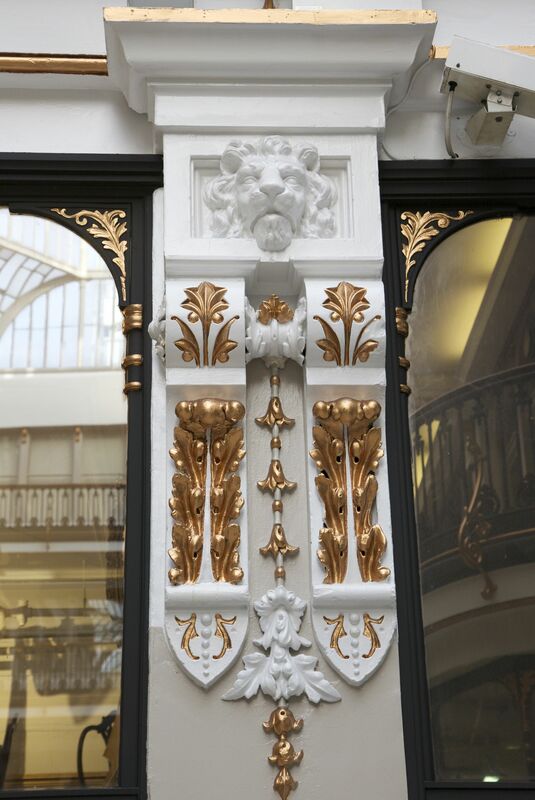 As a new civic space modelled on the Milan Galleria, Manchester’s Barton arcade exhibits its ‘public’ status through its decorative features. Wider than its earlier British counterparts and built on three-levels, the sense of light-filled space is dramatic on entering the arcade via a conventional stone-fronted building (3). The elaborate cresting within the barrel-vaulted glass roof, the lion heads cast onto the shop fronts (4), and the naturalistic foliage seen in the columns and panelling in the exterior of the arcade (5) all contribute to the newfound sense of iron being a material fit for symbolic treatment. Such symbolism was an essential element in Victorian civic architecture, especially in industrial cities like Manchester, whose urban identity was being reconstructed, through high-profile architectural projects, out of its former utilitarian image – a monotonous cityscape of chimneys, vast mills, factories and warehouses. 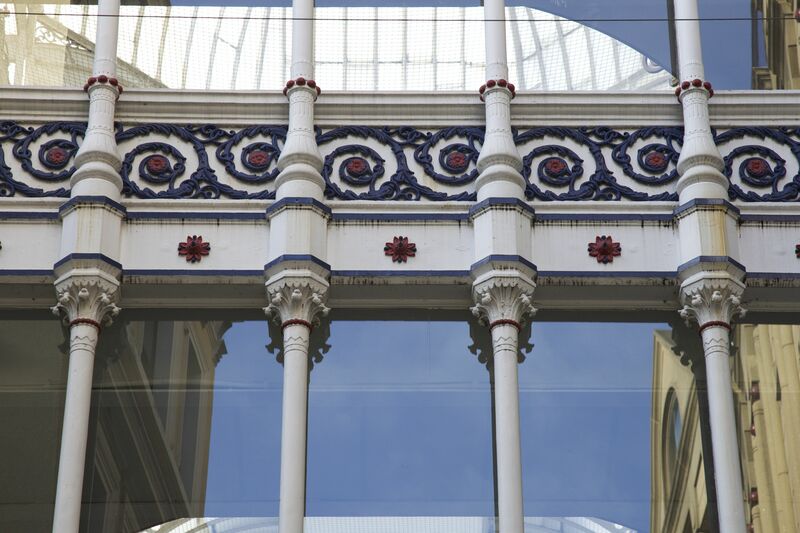 The Barton example initiated an arcade craze in Manchester: Victoria buildings (1874) included a vast galleried arcade, as did the Exchange buildings (1876) and a new arcade was constructed in Deansgate in 1899. None of these other examples survive but they are nevertheless testament to the power of the arcade as a symbol of civic status in Britain in the late-19th century. Similar arcade complexes were also built in other cities around the country, including Cardiff, Birmingham, Newcastle, Glasgow and Leeds. Together, they represented the transformation of Benjamin’s exclusive ‘world in miniature’ to a democratised covered space in the city accessible to all. Yet, despite the best intentions of their progenitors, arcades were always subject to the dictates of supply and demand; they all served commercial functions and were never financed by public money. As a result, their presumed ‘public’ status was in reality subsumed to ruthless economic dictates. The arcades in Manchester quickly fell victim to this schizophrenic status: at best, they were viewed as too spacious to function as indoor ‘streets’; at worst, as wasteful follies built solely on the basis of speculation that failed to attract either shopkeepers or customers. h.g.stephenson ltd were in barton arcade for 99 years selling pottery,glassware etc.the retail shops were sold in 1962 and the company moved to the current site in stockport in 1967.manchester was a great place to work in my younger days:ihave some wonderful pictures of our shops taken at the turn of the eighteenth century. 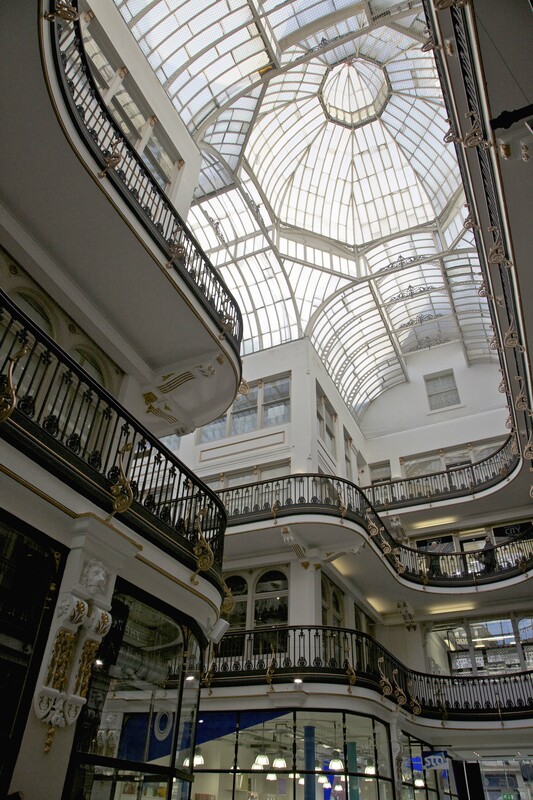 Many thanks for this info on the Barton arcade & what it was like to work in Manchester. Did you work in the arcade? Was it ever a popular shopping place? Today, it’s very quiet, despite the magnificent space. barton arcade was indeed an extremely busy place.deansgate as far as knott mill was full of exclusive and expensive shops.within barton arcade were ellwoods fabrics’scotch wool’manfied shoes’ss hand bags’vent axia’edwards shoes(still there)squirrel cafe and ncb coal utilisation council.i worked in the arcade from 1963 to 1967 andwas a regular visitor from the early fifties.following the sale of the shops in 1962 we retained various offices and catering showroom on the first floor plus the entire sub basement.the only time the business closed was1942 to45 thanks to being blitzed.